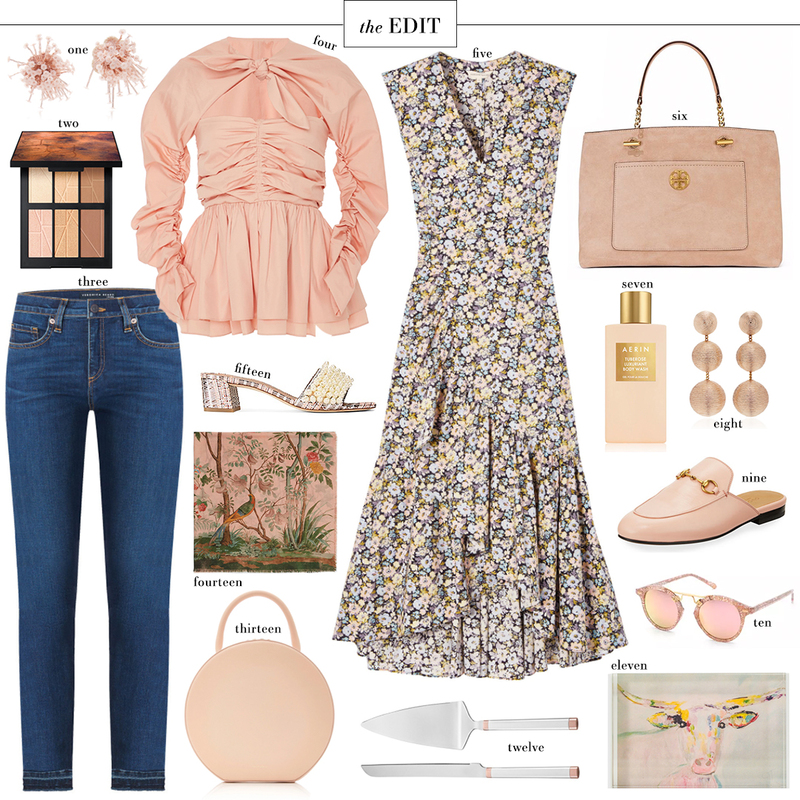 You may look at this EDIT and think of a spring color palette, but don’t be fooled. This peachy pink hue is a big trend for fall! Totally unexpected and utterly romantic, don’t you think? I was shocked to see this color on the beat of what’s coming for fall/winter, but it really is everywhere. What’s great about this shade is that it’s the ultimate transitional color – you can wear it with all of your favorite denim washes now and next spring once the weather starts to warm up again. As you’ve probably heard me say already, velvet is my #1 trend obsession this fall. I want it all! Especially a sleek pair of slides or mules like this-bow adorned pair by Rochas. So pretty! This Keepsake dress is a perfect wedding guest dress for under $100! This J.W. Anderson style is one of 2017’s biggest “it” bags, that’s for sure. These Ferragamo heels are an absolute wardrobe staple, in my opinion. Reminds me of my fave Givenchy heels! This color on an edgy biker jacket softens that moto look, don’t you think? This Emilia Wickstead dress is the epitome of sophistication! Malone Souliers should be on your list of shoe designers if it isn’t already. Dying over this pair of pumps! If my first or last name started with an “R”, I wouldn’t hesitate to snag this cutie. Leave it to Missoni to create a dress that is equally feminine and playful as it is modern and elegant. Since I can’t afford to order the Rochas mules above, I just ordered this Schutz pair to see if I can recreate the look for less! #5 is sooo cute! I love that dress and definitely a closet must-have!